AS WE CELEBRATE OUR HALF-CENTURY MILESTONE HERE AT CLASSIC POP, IT FEELS WHOLLY FITTING THAT WE MARK IT WITH WHAT CAN ONLY BE DESCRIBED AS A LANDMARK ALBUM. 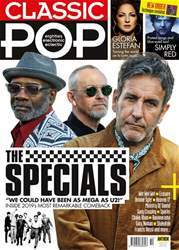 WHEN WE FIRST HEARD WHISPERS LAST AUTUMN THAT THE SPECIALS HAD RECONVENED IN THE STUDIO, WE WERE QUIETLY CONFIDENT THEY’D BE ABLE TO CRAFT A RECORD THAT COULD LIVE UP TO THEIR IMPRESSIVE LEGACY. HOWEVER, THEY’VE FAR EXCEEDED OUR EXPECTATIONS – AND MANY MORE PEOPLE BESIDES, NO DOUBT – WITH THE ASTONISHING ENCORE.